You can not get rid of pimples overnight but this is what most people are looking for , but unfortunately this cant happen . Just remember you have to wait several weeks or more than this, before you see the result. 1.Face should be washed 2 to 3 times a day with sated and luke warm water as salted water removes the oil. 3. Reduce all the stress in your life.Because studies shows that more stress you have-more pimple and acne you will have. 4. 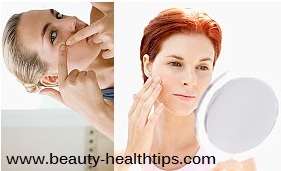 Very effective homemade pimple treatment is the use of cucumber paste. Apply it on your face regualrly for 10-15 minutes as it helps to moisturise the affected area and nourishes with vitamins. 5.Another very effective remedy is- Applying a combination of one teaspoon of lemon juice and rose water is one of the most successful natural home remedies for Pimples and Acne. 1.Some people applying toothpaste on pimple or acne area-but i can damage your skin better allow it to disappear naturally and dont touch taht area by your finger nail always ,if you dont want to take any risks. 4. While washing the face-dont rub the face .Hrd scrubing may agravate the pimple .